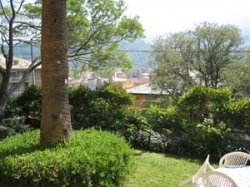 Apartment in Levanto in the Villa Margherita B&B with its own private entry and large garden with views of the town, the sea and the mountains. The apartment is approximately 65 meters (650 square feet) in size. Open room with living room, dining area and kitchen, one double bedroom, one bedroom with two singles, bathroom with shower and washing machine. Telephone, TV with English channels and VCR (videos available). Kitchen well furnished with four burner stove, fridge, and dishwasher. There is a really nice private garden with two big palm trees, a large table for dining and lounging chairs. 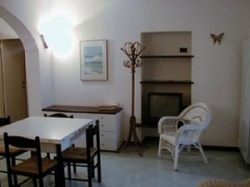 It is an easy walk to the shops and restaurants in town and a short walk to the train station. 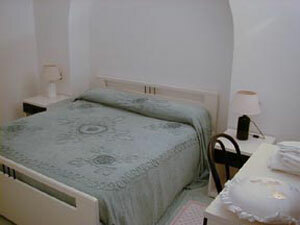 "We had a lovely two weeks in this apartment in September 2003. 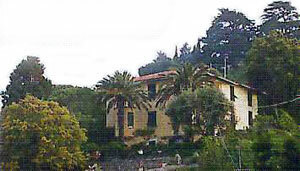 The location is excellent – just steps from town and the beach. The garden is beautiful and we spent many afternoons sitting out in the shade relaxing and admiring the views."